Wow... what a view! It’s all glass! Unmatched views in this spectacular oceanfront condominium with over 34 feet of windows. Relax on the huge private deck with large 4 person HOT TUB. Lie in bed and look out onto the beach and enjoy some cozy time near the beautiful new gas fireplace. Now even better... complete remodel of this incredible 2 bedroom, 2 bath luxury beachfront condominium with all new slate floors, kitchen cabinets, granite counters, appliances, carpet, beds, dining table, linens, etc. Beautiful remodel with New carpet, New Paint and Art Work, New Living Room Furniture, New 32" Bedroom TV's, New Bedding/linens and Towels, etc! Looking for activities, sights, and restaurants in the area? Check out our Area Information Pages. Need help getting around? We offer Maps on our site. Perhaps you're looking for: gas stations, banks, groceries? We love this place. We have stayed here several times. Well equiped, clean, close to Casino, and beautiful view. We will return. I asked to have extra wash cloths available and that happened, your team member was very nice and courteous. Love it, want to stay there again! Awesome. 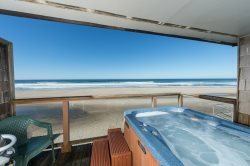 The Perfect Wave is our most favorite place to stay in Lincoln City!! The room and the view just cant be beat! In fact we have stayed at multiple Blue Pacific Vacation rentals in Lincoln City and love them all!! We will be back in June and cant wait!!! Beds and linens are excellent. We also really like how well the kitchen is stocked- which provided us everything we needed for sit in meals!! Very clean and well maintained!! We enjoyed our stay. We have stayed in this condo several times and just love the location. Very efficient in handling the transaction and explaining the answers to my questions. Pleasant phone manners and returned on questions quickly. ABSOLUTELY BEAUTIFUL! We had the most delightful and peaceful stay. We went in search of a resturant to have a dinner and found that there was not a better view then what we already had so made our meals there with the very well appointed kitchen. The sunsets were amazing as the action of the waves...A perfect name...Perfect Wave! We absolutely love the property and will be back soon! It was AMAZING!!!!! The view is to die for! This rental was a perfect relaxing place to spend the holiday weekend!!! Very friendly and knowledgeable. I would rent with your company again. It was a pleasant experience. Your team was helpful and easy to work with. We really enjoyed our experience with blue pacific vacations. They were great to work with and very accommodating. Every correspondence we had with them was great. We had to switch condos midway through our stay because of availability and they made it so we could get into our new condo early. I would definitely book through them again and I have already recommended them to a friend who is planning a vacation here. We ABSOLUTELY LOVED the Perfect Wave. It's in an amazing location. The view is amazing and the walks on the beach and nighttime fires on the beach are something we will never forget. The condo was so cute and cozy and had everything we needed right down to the kites! We loved sleeping with the door opened and listening to the waves all night. The hot tub was an awesome bonus and we used it every night while looking at the stars and listening to the waves. We will definitely stay here again when we come back. Perfect, peaceful, relaxing... we will be back next summer. Overall, our stay was delightful. The exterior of the building is quite humble but when you walk in it is just beautiful. Wall to wall windows, covered parking, and an amazing hot tub were the high points. The beds were comfortable, the kitchen delightful, and easy access to all areas. Didn't make it to the casino but truly enjoyed our visit. Nice to just walk down the stairs to the beach.